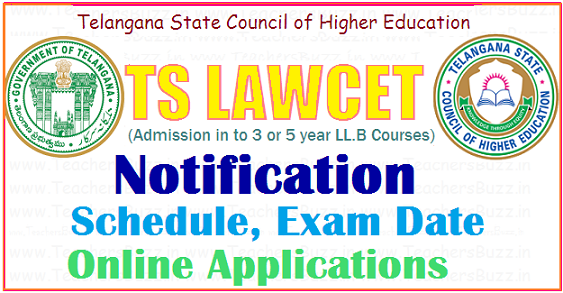 Telangana LAWCET 2019 Notification, Schedule, Online Application | TS LAWCET 2019 Apply Online at lawcet.tsche.ac.in : elangana State Law & PG Law Common Entrance Through Computer Based Test (CBT) A Common Entrance Test, designated as Telangana State Law Common Entrance Test-2019 (TS LAWCET-2019) and Telangana State PG Law Common Entrance Test - 2019 (TS PGLCET-2019) will be conducted by the CONVENER, TS LAWCET/ TS PGLCET-2019, Osmania University, Hyderabad on behalf of the Telangana State Council of Higher Education for admission into 3Year / 5Year LL.B. Regular Courses and 2 year LL.M. Courses in the Colleges of Law in Telangana for the academic year 2019-2020. Eligible candidates shall apply through online mode only from 15.03.2019 to 15.04.2019 (without late fee), and may log onto lawcet.tsche.ac.in & pglcet.tsche.ac.in for further information. TS LAWCET 2019 / Telangana TS LAWCET 2019 Exam date, Notification, Online application form, Fee, Eligibility criteria, syllabus, Important dates, Selection process, How to Apply, Exam schedule, Regional centers, Courses offered, hall tickets, results details are given here. TS Law Common Entrance Test (TS LAWCET- 2019) for admission into 3 / 5 years law courses (LL.B) and TS PG Law Common Entrance Test (TSPGLCET-2019) for admission into LL.M courses offered by State Universities in Telangana State including their affiliated colleges for the academic year 2019-20 will be conducted by Osmania University, Hyderabad, Telangana State. The Candidates for 3 year LL.B. should have passed any Graduate Degree (10+2+3 pattern) of a recognized University with 45% of aggregate marks or any other examination recognized as equivalent by the Universities concerned. If any candidate secured less than 45% in graduation he should have passed any additional graduation or post-graduation with 45%. i) There is a relaxation of 5% of marks in the above qualifying examinations for 3 year Law course in favour of the Candidates belonging to SC/ST Category. ii) The percentage of 39.5% and above in aggregate marks in case of SC/ST candidates and 44.5 % and above in aggregate marks in graduation(10+2+3 pattern) in case of candidates belonging to other categories will be considered as 40% and 45% of marks respectively for admission into LL.B. 3 year course. i) There is a relaxation of 5% of marks in the above qualifying examinations for 5 year Law course in favour of the Candidates belonging to SC/ST Category. ii) The percentage of 39.5% and above in aggregate marks in case of SC/ST candidates and 44.5 % and above in aggregate marks in Intermediate (10+2 pattern) in case of candidates belonging to other categories will be considered as 40% and 45% of marks respectively for admission into LL.B. 5 year Integrated Degree course. iii) The Eligibility criteria are subject to change as per the Government Orders issued from time to time. qualifying percentage of marks is prescribed. TS LAWCET syllabus will be of degree level for 3 year law course and intermediate level for the 5 year law course. Question paper medium will be in English and Telugu languages. Total 120 objective type questions will be asked in the examination. The duration of the exam will be 90 minutes. The question paper comprises of three parts which are General Knowledge and Mental Ability, Current Affairs and Aptitude for the Study of Law. There is no negative marks for this exam. The online registration For TS LAWCET – 2019 is 800/- (500/- in case of SC/ST Candidates). The fee payment can be made via online process through debit/credit card or net banking. Candidates can also make payment through the designated AP online centres. In terms of orders issued by the Government of Telangana State and the proceedings by Telangana State Council of Higher Education, Hyderabad, ONLINE APPLICATIONS are invited for appearance at the TS Law Common Entrance Test for admission into 1st year LLB (3YDC & 5YDC) and LL.M Course for the academic year 2019-2020. Candidates can apply through online mode. Candidates who wish to apply for Telangana LAWCET 2019 are requested to fill the particulars carefully in ONLINE APPLICATION. The required information should be collected from the relevant documents. The TS LAWCET 2019 Application Form will be released by the authority from 15th March 2019.Candidates can fill the application form till 4th April 2019 (without late fee). The application form can be filled and submitted through the official website of the authority https://lawcet.tsche.ac.in Candidates have to upload the scanned images of their passport size photograph and digital signature.